Big Art Group at PRELUDE13 Oct 3, 2013 5:30 pm – 6:15 pm (NYC) Free! This coming Thursday, Big Art Group will be giving a presentation on our serial project THE PEOPLE at PRELUDE13. We will also show video from the 6 other installments and perform a short section of the work. Come by and chat with us afterwards. We are also looking for collaborators for the New York installment in MAY 2014. The People – L.E.S. is the 6th installment of a serial project created by Big Art Group. It takes place as an hour long live performance simulcast in a 5-channel wide monument sized video on the outside of a public building to a audience viewing from the street. 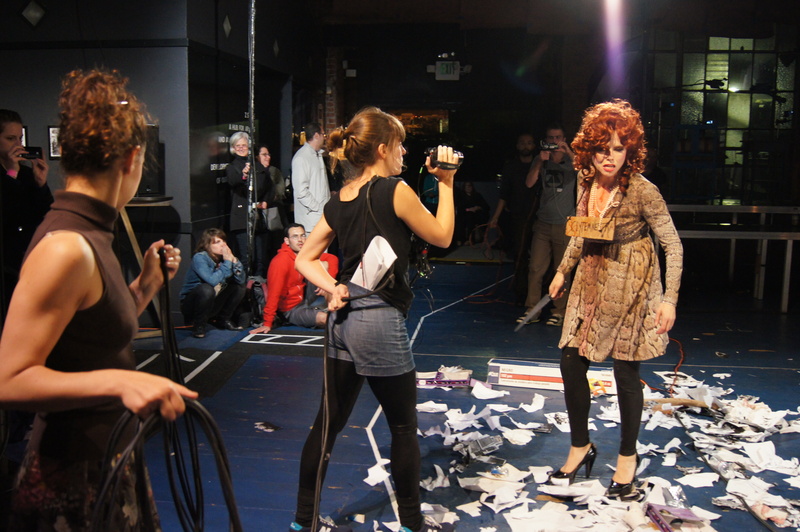 Incorporating Big Art Group’s virtuosic mix of live action/video, the narrative is constructed from interviews conducted with community members of the Lower East Side, who voice their thoughts about democracy, war, terrorism and justice as it relates to their personal histories.it retells a version of the Greek tragedy cycle The Oresteia to investigate the contemporary nature of democracy and justice and the relationship of the networked public to mediated information. Artist Statement: The People serial project originated as a 2007 commission from Inteatro Polverigi in Ancona, Italy and the desire of the company to create a project that interacted deeply with the community as well as drawing its dramaturgy from local participants. It takes its narrative from the Greek tragic cycle The Oresteia, in which the citizens of Athens come together to arbitrate a solution to a series of murders precipitated by a bloody code of justice that demands revenge for every blood crime. The project has been co-produced and presented with Inteato Polverigi (Italy), Theater der Welt (Germany), Szene Salzburg (Austria), Yerba Buena Center for the Arts (San Francisco), and TBA Festival (Portland, Oregon). About Big Art Group: Big Art Group was founded in New York in 1999 by Caden Manson and Jemma Nelson. The company uses language and media to push formal boundaries of theatre, digital media and visual arts creating live performances, installations, participatory events and online works using original text and immersive technology. In its short history, the company has risen to international prominence through its Real-Time Film trilogy (Shelf Life, Flicker, House of No More), and its collaborative, site-specific, and ensemble work (The Sleep, Cinema Fury, The People, S.O.S.). It has toured extensively in Europe and North America (Festival d’Automne à Paris, Hebbel am Ufer, Wiener Festwochen, Szene Salzburg, REDCAT, Usine C and many others) as well as regularly presenting work in New York (Abrons Arts Center, The Kitchen, PS 122, Dance Theater Workshop). Upcoming for The People: The People – L.E.S. will be presented with Abrons Arts Center at the end of April 2014.
http://secureservercdn.net/198.71.233.204/9d3.d38.myftpupload.com/wp-content/uploads/2013/09/DSC07762.jpg?time=1555789772 3264 4912 Big Art Group http://secureservercdn.net/198.71.233.204/9d3.d38.myftpupload.com//wp-content/uploads/2013/07/bignontranslogo3.png Big Art Group2013-10-01 10:58:462013-10-01 11:13:08Big Art Group at PRELUDE13 Oct 3, 2013 5:30 pm - 6:15 pm (NYC) Free!